Water infiltration can cause considerable damage and cost you a fortune. Spring brings with it sunny days and milder temperatures that will quickly melt the ice and snow that has accumulated on and around your home. That’s why prevention is key! Here are some tips about gutters and sump pumps to help you protect your home from water damage. As the snow melts, huge quantities of water flow from the roof, running into the gutters. 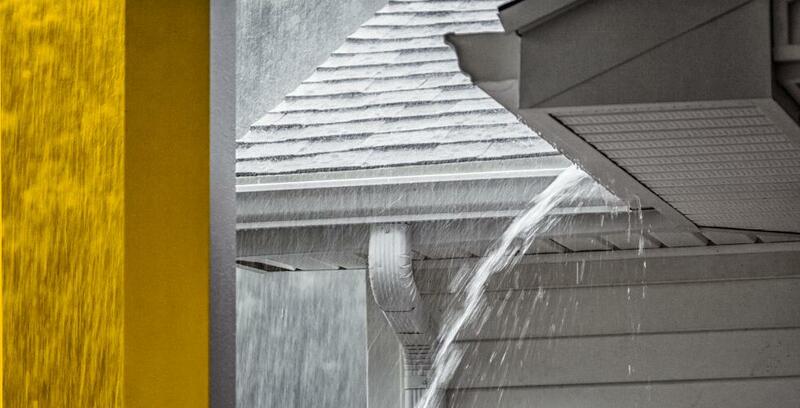 To prevent water from getting in to your home, it’s very important to check your gutters. If a gutter is clogged, water can seep into the roof or overflow and drip near the foundation, putting your home at high risk of water damage. In spring, ice can also block up your gutters, preventing the water from flowing freely. The best way to prevent ice build-up is to use a gutter guard or continuous hanging system that will keep the snow and ice on top of the gutter and allow water in the gutter to drain normally as everything thaws. The freeze/thaw cycle causes gutters to expand. This can cause major damage, especially if your gutters are nailed on. Installing them using continuous hangers helps prevent deterioration. Ice and snow stays on top and can drain through the gutter as it melts. This prevents expansion, since water isn’t sitting in the gutter. Once the water drains through the gutter and out the downspout, you need to make sure that it runs away from the foundation. Water that sits near the foundation can leak into the basement. To keep this from happening, water must be diverted at least six feet (1.8 m) away from the house. One way to achieve this is with a ground slope. The two best solutions for diverting water away from troublesome downspouts are to install a gutter downspout extension or dig a downspout dry well. Made with a geomembrane and gravel, a dry well allows runoff to trickle into the soil slowly. A sump pump can help you prevent water damage and save you some big headaches. Sump pumps send water from a French drain or the water table to a municipal storm drain. You can use this system to waterproof the basement and foundations of your home. There are different types of pumps, so talk to a professional and get the model that’s right for your home. Be sure to read the pump manufacturer’s instructions before use. Contact your municipality to find out where to discharge the water from the sump pump. Depending on the problem, you can decide to have the pump repaired or replaced. If the pump is over ten years old, it may experience mechanical issues and fail to work when the time comes. We recommend replacing it in this case. We hope you find these tips useful. Making sure your gutters and sump pump are working properly will greatly reduce the risk of water damage in your home. It will give you peace of mind so you can avoid any nasty surprises and enjoy all spring has to offer!